VGOD Elite RDA features 24mm in diameter with a dual post design and 2ml-hole per post for an easy building. Its 9.25mm deep juice well offers a maximum of 2ml e-liquid storage. Together with the bottom airflow and protruding gold-plated 510 pin, VGOD Elite DRA will bring you optimal flavor with huge cloud. 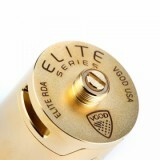 VGOD Elite RDA measures 24mm in diameter, which is made from high quality hybrid friendly protruding gold plated 510 pin. The RDA features dual posts design building deck with 2mm large sized fixing hole for easy building. Together with bottom airflow system and a short top cap, VGOD Elite RDA will bring you optimal flavor with huge cloud. In addition, the finger tight nut is compatible with both Philip and flat screwdrivers. 4 colors are available to meet your various needs. • It doesn't comes with e-juice. Ordered both VGOD Elite mech mod and Elite RDA for my husband as his birthday gift. He was sooo happy about his new vape gear. Thank you. Elite RDA is very easy to build with. Airflow was smooth and I love the flavor. Pefect match for my Elite mech mod. Cloud beast! 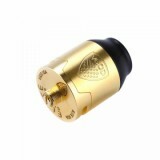 Very good rda with good price.